This was card # 2 for the single layer challenge. This one had to be a "guy" card. 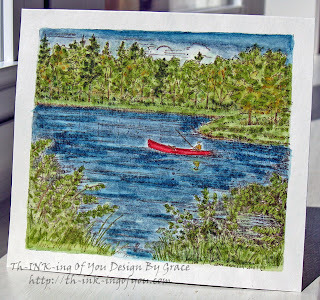 I used a Northwoods Rubber Stamp, and stamped it with Stazon on H2O paper. I found this difficult to color because it was so heavily lined. I decided to just do a real watercolor wash on it, so I used SU! Markers and a paint brush. Then I added detail to the leaves, trees, water etc. Of the three cards, believe it or not this one took me the longest. This reminds me so much of my hubby. He loves to fish and has a red canoe, so I painted the canoe like his. I think he'll like this one. Hope you do too! I think your middle name is Picaso. This could be framed. Beautiful.